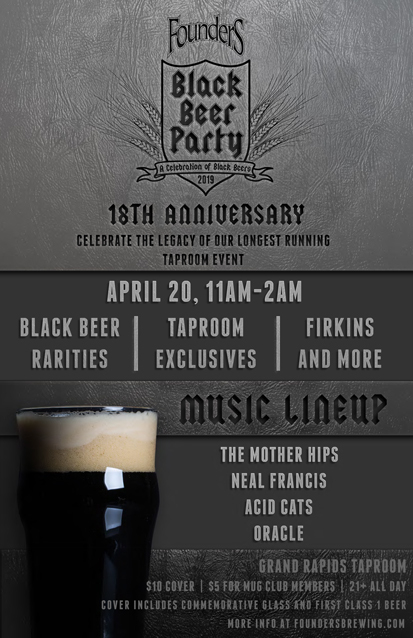 Founders 18th Annual Black Beer Party - Founders Brewing Co.
We invite you to our 18th Annual Black Beer Party! Black Beer Party is one of our absolute favorite parties of the year, and is the longest-running of our annual taproom events. For the past 17 years, we’ve showcased our most-lauded black beers: from massive barrel-aged stouts to sweet, smoky porters to hoppy-yet-roasty black IPAs and more. All of your favorite dark beers will be featured, including rarities, taproom exclusives, one-offs, and some brewed just for the event (full Black Beer Party tap list to come). Our culinary team will be creating specials for the event and a full evening of live music begins at 5pm, featuring an annual performance by Oracle (our Brewmaster’s and R & D Brewer’s band). The $10 cover charge at the door ($5 for Mug Club Members) gets you: access to the event & entertainment, a commemorative Black Beer Party pint glass that’s yours to keep, and your first pint of any class 1 beer. There are no advance tickets for this event, just cover at the door, day-of-only, first-come, first-served, based upon capacity. The taproom will be ages 21+ ONLY all day. PLEASE NOTE THE TAPROOM WILL BE CLOSED THE NEXT DAY, SUNDAY, APRIL 21 FOR EASTER. Acid Cats is an energetic sextet that sets syncopated melodies on top of driving grooves to make you stand up and move! An installment of instrumental madness piecing together Funk, Jazz, Latin, Rock, and Soul into a fierce Fusion of our musical influences. Neal Francis’s music is steeped in New Orleans rhythms and Chicago blues. 7″ coming early 2019 from Karma Chief.